We do not tend to think of sounds as a part of our cultural history, but many everyday sounds have been consigned to history never to be heard again. 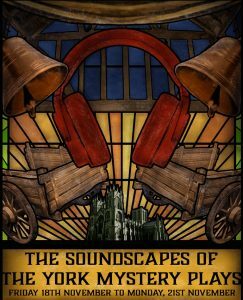 Seeking to recreate a more three-dimensional version of history, the sound installation, ‘The Soundscapes of the York Mystery Plays’ invites participants to immerse themselves in medieval York. The installation gives attendees the opportunity to listen to the recreated soundscapes in the 16th century. The installation also includes a combination of archival sound recordings on the modern performances of the plays as well as newly recorded material.